Director Marion McClinton embraces Contanza Romero-Wilson. Photo by Caroline Yang. Penumbra Theatre, one of the nation’s most venerated African-American companies and one whose most famous member is Pulitzer Prize winning playwright August Wilson, raised more than half-a-million dollars at its 40th anniversary Saturday — a day that St Paul mayor Chris Coleman declared Penumbra Theatre Day. The unprecedented fundraising haul of $560,000, which represents about a quarter of the theater’s $2 million annual budget, is a resounding statement of support for the company as it enters a new era. Visionary founder Lou Bellamy, who was feted at the event, stepped down at the top of the year to make way for the solo leadership of Sarah Bellamy, his daughter who grew up in the theater. The younger Bellamy, who is respected across the country for her intellect, passion and moral compass, is building on the company's foundations to expand its scope and reach. “I have every confidence that under our new artistic director’s leadership the company will continue to create art that honors the past, addresses the present, looks to the future,” said Lou Bellamy. Saturday’s confab, hosted by charismatic company members T. Mychael Rambo and James T. Alfred, was held at the studios of TPT public television. The festivities included music by a Sanford Moore-led band fronted by such singers as Greta Oglesby, Dennis Spears, Thomasina Petrus and Alexis Sims, star of the musical “Girl Shakes Loose,” which had its successful premiere this spring at Penumbra. There were also surprising auction items on offer, including a birding trip with Sarah Bellamy to Hawk Ridge Observatory in Duluth. That she’s an enthusiastic naturalist should not be much of a surprise. When he is not directing shows or hitting the links, Lou Bellamy is an avid outdoorsman who hunts and fishes. The gala celebrated original company members such as Austene Van, Lester Purry, Faye Price, James Craven, Regina Marie Williams, Terry Bellamy, Tonia Jackson, Abdul Salaam El Razzac, H. Adam Harris, Kevin West, James Austin Williams and Marion McClinton, the playwright, actor and director. 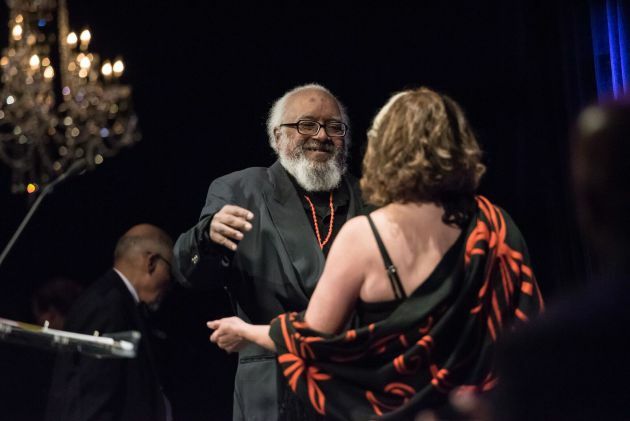 McClinton, who shepherded Wilson’s later works to Broadway, was presented with the inaugural August Wilson Visionary Award by Wilson's widow, the award-winning designer and producer Constanza Romero-Wilson. She flew into town to present the award, a cut-out wooden sculpture of Wilson's likeness designed by visual artist and longtime company member Seitu Jones. In his acceptance speech, McClinton noted that with “Jitney” playing on Broadway this season, all ten plays in Wilson’s decade-by-decade chronicle of African-American life in 20th-century America have now made it to the Great White Way. Singing actor Spears also won the inaugural Lou Bellamy Award for Artistic Excellence. Moved to stuttering, he recalled walking into Penumbra to audition as a green, but eager performer. The gala was attended by around 200 leaders across many fields. Those from the corporate world included Target’s Laysha Ward, 3M’s Kim Price as well as two executives from Ecolab — CEO Doug Baker and COO Tom Handley. Attendees also came from the philanthropic world, including McKnight Foundation president Kate Wolford; Sharon DeMark of the St Paul Foundation; and Eric Jolly of Minnesota Philanthropy Partners. There were also prominent longtime Penumbra supporters such as Josie Johnson, Shirley Pearl and Reatha Clark-King as well as board members Phyllis Rawls Goff, Stew Widdess and former managing director Chris Widdess. Board chair Jeff Saunders spoke with passion. A visibly moved Sarah Bellamy took the stage to thank those who have supported the theater through its struggles and triumphs in the past and urged continued support as she plants new seeds for the theater's next chapter. "I can’t yet see exactly what will bloom, but I know that I am planting on sacred ground," Bellamy said.